Here's an update comparison chart with this month's values. Nougat gained more this month (2.2%) as a share of all devices than it has in any previous month. Last month was close at 2.1%. Even 7.1 (which runs on fewer devices) moved up slightly. This puts it at 7.1% total across the two versions. 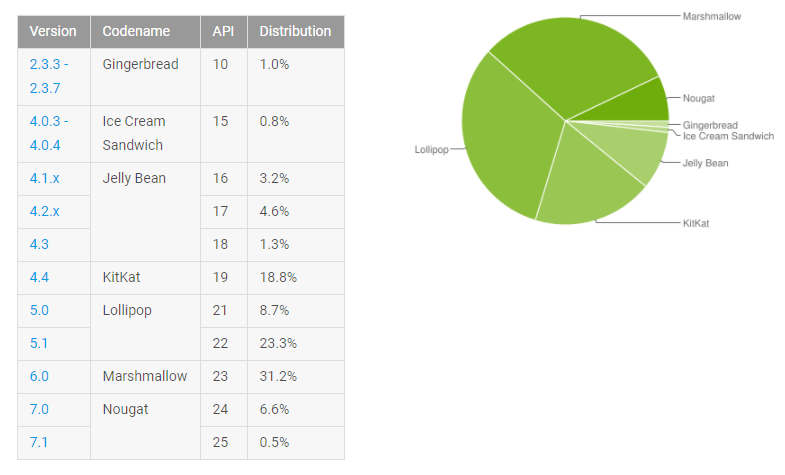 At this time last year, Marshmallow was running on 4.6% of devices. So, Nougat's rollout continues to outpace the last version. The situation with Gingerbread is unusual. It fell to 0.9% of devices last month, but this time it's back up to 1.0%. The absolute number of Gingerbread phones still declined, I'm sure. This could be a rounding error, or perhaps it didn't decline as fast as other versions. Thus, it has a higher share this month. The 0.3% gain for Android 5.1 is too big for rounding, so it's probably the latter. All the other older versions of Android are down as expected.